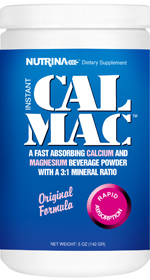 Calmac™ Original, a worldwide best seller and a long time favorite of our customers, supplies calcium and magnesium in a 3:1 ratio (450 mg calcium and 150 mg magnesium). Directions: This product is as easy to prepare as making a cup of tea. 2. Put two teaspoons of the powder in a cup and fill 1/3 to 1/2 with boiling water. 3. Stir until the liquid is clear. 4. Add some mildly acidic juice (such as apple juice, or more hot water and an herbal tea bag. Keep container tightly closed in a cool, dry place, out of reach of children. Other ingredients: Citric Acid, unsweetened lemon juice powder.